I learned today, via Paul Bream, the sad news that tenor saxist Johnny Griffin has died at the age of 80. Once known as 'The Fastest Gun in the West', the 'Little Giant' - a title he appropriately shared with Tubby Hayes - made a memorable appearance at Newcastle's Connaught Hall back in the 1960s - one of Jazz North-east's earliest promotions. 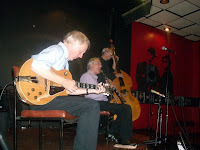 I remember the concert well as I was propping up the bar of the Eldon Grill for a pre-concert beer when Johnny Griffin and pianist Damian Robinson came in and stood next to us. Immediately, my buddy, Charlie Carmichael, attempted to engage him in a conversation about mouthpieces but Johnny was more interested in the products of Newcastle Breweries than Otto Link. Finding our local brew to his satisfaction, he then crossed over to Connaught Hall where he preceded to give a masterclass in saxophone playing that may well have influenced Charlie's future stylistic endeavours. Who knows but that even now they are talking mouthpieces? Farewell to another one of the greats. The curate hatched a few eggs at the Chilli tonight. One of the better ones in the first set was "Billie's Bounce" with Dave W scatting and blowing his distinctive muted horn. I've never quite worked out why he has a mike attached to the bell of the trumpet when he's blowing into another mike already? Mysterioso. Young Tom on alto and tenor rounded off the frontline and they got a good sound on most numbers although "Night in Tunisia" had a moment or two of mayhem. The second set saw the band segue from quintet to nonet (nine) and "Beautiful Love" was as funky as it gets. Don Forbes and another trumpet player whose name I didn't catch joined Dave in the trumpet section whilst one of the lasses who played a couple of weeks ago sat in on tenor. Again I didn't catch her name but that's her on the far right of the photo. Got a good sound. David C on piano and on drums a couple of numbers later plus Daniel on guitar alongside John Pope completed the line up as Barry and Eric 'took 5'. "My Funny Valentine" looked like lasting until next Valentine's Day as solo after solo unravelled. Not that their was anything wrong with the solos there were just too many of them for such a slow number. A better bet when there are so many on stage would be a ballad medley. That way it wouldn't be any shorter but at least there'd be a bit of variety. Still a small quibble for a session that had its moments. Street whispers say that the NEJC Monday night sessions start up again on 1st September with the Paul Edis Sextet. Spread the word. Four musicians of undoubted ability, indeed I would go so far as to say that Jim Hart is probably the best vibes player currently around. Despite that, I couldn't really get into the band as a whole - sum of the parts and all that jazz. Perhaps the trouble lay in the original material. Nothing wrong with original compositions if they are pieces you can latch onto without too much effort. Tonight, the latching on to was difficult. Maybe part of me was longing to be outside enjoying the rare summer's evening whilst sipping Ouzo on the Ouseburn. Whatever, I found my concentration drifting when Hart wasn't soloing even though Aussie Adam did have some good moments and the rhythm section of Larry Bartley (bs) and Shaney Forbes (dms) were as free or as tight as the music decreed. Disappointing but I'm sure the fault was as much mine as theirs. Earlier, a short set by the Paul Edis Trio consisted of three "originals" written by Paul that were easier to come to terms with; possibly because I'm more familiar with his work or perhaps it was because he was on first. Someone sitting in my company said wistfully during the second set by the headliners - "Oh for just one standard." Not entirely my sentiments, but I knew how he felt. When asked by an aspiring clarinet player how he could learn to play like Pee Wee Russell, Benny Goodman replied, "Stop practising." Thanks to George McDonald for that gem from yesteryear. Seems like these Canadians are everywhere. After Michael Bublé and George McDonald; Diana Krall. Not that Mrs Costello was at The Arena or Blaydon Sports and Social Club just as I wasn't at the Montreal Jazz Festival of 2004. Fortunately Diana Krall was at that prestigious event and the results are on a DVD they were selling off in our local library. Great vocals and great piano from the lady. Great guitar from Anthony Wilson whilst Peter Erskine (drums) and Robert Hurst (bass) rounded off the rhythm section for one and a half hours of magic. It's quite amazing the way Princess Di can play an intricate phrase of maybe 8 or 16 bars then take both hands off the keyboard, run her fingers through her hair, adjust her top and go back to the phrase seemingly without missing a beat. My good friend Russell, one of Jazz North-east's troops on the ground, has pointed out to me that the Chillingham (Chilli) Arms is in fact simply called "The Chillingham." This means that now when you leave, as well as being legless you are also armless and, after an outré vocal from Dave, probably headless as well. This has nothing to do with Bach apart from being the name of an Alec Templeton piece that Benny Goodman recorded back in the 1930's. George McDonald who, as former principle clarinetist with the Northern Sinfonia, is no stranger to the music of Bach showed tonight at Blaydon Sports Club that he is on equally good terms with Benny Goodman. It seems as though every concert these days has a BG connection and George lost nothing by comparision with forerunners Alan Barnes and Matthias Seuffert in this summer's surfeit of swing. Indeed tonewise, he was perhaps the nearest of the three pretenders to the crown. It had been a long time since I'd heard Canadian George - it's been a good week for Canadians - in a jazz situation - and he didn't disappoint. Not that was it all Goodman; a touch of Artie Shaw on "Stardust" and a lot of George McDonald on "Here's That Rainy Day" and "Wave." On guitar Jim Birkett also dazzled, slipping into Django mode for "It Don't Mean A Thing" and a super fast "After You've Gone." With virtuoso number three, Pete Stuart, on bass the result was a tightly knit group that delivered the goods without a sheet of manuscript between them. That doesn't happen too often these days! There are a lot of good gigs coming up at Blaydon over the next few months and Roly Veitch has to be commended for his efforts. Details can be found on his own website (see Link in sidebar). A night of sheer delight. One and a half hours of unbroken entertainment by a man who can hold his head as high as any of his peers dead or alive and, given that he is now 82, there aren't too many in the latter category. However, unlike his most illustrious peer, the voice hasn't withered nor custom staled its infinite variety. Nor is there anything wrong with his piano playing. The bop licks of his youth may be less apparent, replaced by big band voiced riffs and delicate chordal explorations, but the jazz feel is inherent in every thing he plays - even that most inane of tunes "MacArthur Park". Not that this was a one man show - far from it. Lezley Anders A.K.A. Mrs Greco sang a few numbers as well adding a touch of glamour and humour. The duet, "Making Whoopee," was particularly well done although "Begin the Beguine" in a minor key didn't, at least for me, quite come off. 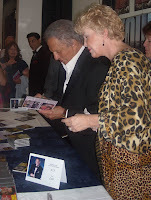 The photo shows Buddy and Lezley signing albums. To Buddy's right is another singer - Attila - who Buddy introduced and who sang a couple of numbers in fine Sinatranic style. As an encore all three vocalised on "Our Love Is Here To Stay". Bass and drums gave good support but unfortunately I didn't catch their names. A most enjoyable evening that wasn't without incident before a note had been played. Sitting in front of us, a chap balanced his drink on a narrow rail in front of him and promptly knocked it into the lap of the woman, a stranger, sitting next to him. Follow that Mr Greco I said and follow it he did indeed. The 1971 prize fight for the World Heavyweight Championship between Joe Frazier and Muhammad Ali must have been quite a swinging affair. It was billed as “The Fight of the Century” and, to get as close as possible to the bloody action in Madison Square Gardens, Frank Sinatra worked as a photographer for Life Magazine. Nancy Wilson was there, Streisand; just about everyone who’d Lullabyed in Rhythm was there. A billion others watched around the world. In the pre-fight hype, Frazier announced that he had booked Count Basie's band for the post fight party. Ali countered by saying that he had booked Duke Ellington for his victory party. Basie got the gig after 15 bruising rounds although Duke won the two return bouts. Michael Bublé paid his second visit to the Metro Arena on Friday 18th July 2008 and what a visit! A 30 minute offering from a support group led into a two hour session with Michael and his decidedly young band displaying a wonderful rapport with the sellout audience of all ages; teenagers, middle-aged fans and a sprinkling of more senior types. If the Bublé bandwagon returns and return they must on this performance, don't miss it! An overall asessment? Well how about Fantastic, Fantastic, Fantastic! On another site, regular Bebop Spoken Here contributor Liz makes reference to the song "Skylark". As I was bored I looked up the song in the poor man's Britannica - Wikopedia - and came across the following gem. "Skylark" is an American popular song with lyrics by Johnny Mercer and music by Hoagy Carmichael, published in 1942. Mercer said that he struggled for a year after he got the music from Carmichael before he could get the lyrics right. The yearning expressed in the lyrics is Mercer's longing for Judy Garland, with whom Mercer had an affair. You learn something everyday. William Bone-Hardy wasn't, as far as I know, a musician and in recent years he didn't get to concerts or gigs; nevertheless, his enthusiasm for the music of Duke Ellington was on a par with those other two great Ellington devotees - Hughie Aitchison and Brian Fisher - themselves gone to the Cotton Club up there. The last time I spoke to Bill Hardy, as he liked to be called, was a couple of years ago in Asda. Despite his advanced years, he looked well but bemoaned the fact that he had outlived his heroes, by which he meant Ellington, Hodges etc., and that there was no longer any music being produced that was worth listening to. I could have argued but didn't; I knew that at that stage in his life he would not be receptive to change. I was just pleased to know that he was still around and getting pleasure from the music he'd enjoyed for most of his life. I met him back in the early 70s when I was working on the jazz record section of a local music store and he was a regular customer. We had many discussions on jazz often from opposite sides of the fence but always with mutual respect. He was that rare breed of person who could be called 'a true gentleman'. When he died this week, well into his 90s, jazz music lost one of its staunchest supporters. Condolences to wife and family. The Sound of Surprise has never been better used to describe a jazz happening than when placed in the context of Take it to the Bridge's Wednesday night sessions at the Chilli Arms. Even the players don't know what to expect let alone the audience which sometimes outnumbers the band. Tonight was no exception; there were surprises a-plenty. The opening "Lester Left Town" had Darren Grainger (alto) and a young guy called Tom (alto/tenor) alongside Dave Weisser in the front line. It was a good sound with both saxes stretching out. After a meandering take on Jobin's "How Insensitive", "Angel Eyes" gave a foretaste of things to come! Dave's vocal wasn't exactly à la Frank but it did have originality and the horns had a good blast on the final chorus. The second half saw the frontline augmented by no less than three girl sax players! Nicola, a regular, on baritone plus another on alto and a third one on tenor. Unfortunately, I didn't catch their names so if they read this please let me know. They all blew well with the two newcomers having a good workout on Jaco Pastorious' "Chicken". The surprises didn't end here. Mike Clark gave John Pope a spell on fretless and no less than Stu Collingwood sat in for Barry on Herbie Hancock's "Cantaloupe Island." As usual, Eric kept the engine running smoothly (ish). "The world record for wrecking a grand piano is, I believe, around 14 minutes. On Friday night at the Royal Festival Hall it often looked like being lowered ..." Benny Green reviewing a 1962 concert by the Dave Brubeck Quartet. Back to the delta with the Rae Brothers who, according to our man on the spot, gave a typical Rae Brothers performance which means authentic sounding versions of Crescent City Classics and some not so well known pieces; all done with real feeling for the roots of our music. I've heard more hot dance orchestras during the course of the past seven days than I've heard in the past 50 years and it has to be said that the Bratislava Hot Serenaders are probably the best of the lot. Despite the longest public soundcheck in history, music and noise interference from another stage and below average temperatures BHS delivered the goods. In particular, the Boswell Sisters - reincarnated as the Serenader Sisters - impressed with their vocal harmonising as well as lookng good. The soloists, whilst perhaps not out and out improvisers, played with lots of drive and fire in their bellies and the ensembles captured the flavour of the era with tricky saxophone trios and tightly muted brass out choruses. The drummer even had a gong - how authentic can you get? Sunday's session began with the ambiguously titled 'Jazz in the Afternoon.' The trombone/tenor frontline of Derek Fleck and Ian Macaulay produced a funky sound on "Watermelon Man" and a calypso like version of "Muscrat Ramble" in contrast to their more traditional approach to "Careless Love". Other gems included "Somebody Loves Me" and "Stranger on the Shore". The rhythm section comprised Brian Chester (pno), John Hallam (bs) and Fred (depping for Marshall Walker) on drums. Unfortunately, commitments elswhere meant I had to miss the set by the Vieux Carre Jazzmen. Sorry about that guys, I'll catch you sooner rather than later! How many Swiss vibes players have you heard this week? Not many, I warrant. I thought I'd had my quota when I heard Raymond Graisier at Thursday's Benny Goodman concert where he brilliantly took on the mantle of Lionel Hampton. M.Graisier turned up again today with the strangely named "MaMa & the Kids" not only vibing but also, drumming, washboarding and vocalising. Amazing! He also duetted with the leader Levon who was also an excellent vibes player from Switzerland. Jacques Ducrot blew alto and clarinet as well as playing drums when Graisier was on vibes. Pierre-Alain Marat, on guitar, also happened to be Levon's father. Henri Lemaire played bass. A swingy band slightly more modern than the previous outfit. It seems like hot dance music from the 1920s is the thing these days! The Chicago Stompers from Italy gave an al fresco (no relation to al capone) performance at the Mouth of the Tyne Festival in Tynemouth. Like last week's Red Hot Rhythmakers they were young and not totally male. I'll re-phrase that; there were two girls in the band (see photo left) Veronica, pink dress and vocals, and Vanessa, tenor sax, clarinet and ukulele. The girls also Charlestoned with style. This I had to Hear! When I read the review below I had to find out more. It was a voyage of discovery. How come I'd missed out on Mary Stallings? We're about the same age. Don't make the same mistake - check her out. An eve of festival (Whitley Bay) presentation at The Sage, Gateshead, this event commemorated the 70th anniversary of the late Benny Goodman's legendary 1938 Carnegie Hall concert. Needless to say, none of the original participants were present; I'm sure they are all dead athough, no doubt someone will point out to me that some obscure sideman is still alive. I doubt if any of tonight's band were born in 1938! Nevertheless, in a near capacity Hall One, the audience made up for it; many of them were old enough to have been at the original concert! Not that this dampened their enthusiasm. The role of Benny was taken by Matthias Seuffert, a young German clarinetist who handled the note for note recreations with ease. Enrico Tomasso, as Harry James, blew with fire as did Andy Woon (or was it Nathan Bray?) who played Ziggy Elman. Joan Viscant 'did' Martha Tilton and Peggy Lee quite effectively. Martha only died in 2006 so she almost didn't need a dep. The whole affair was led and narrated from the piano by Keith Nichols. Now comes the difficult bit. How do you pass judgement on note for note recreations? I'm not going to attempt to; let's just say I enjoyed it for what it was. If I'd wanted twenty-first century, totally(ish), improvised sounds I'd have went down to the Side Cafe and dug Lol Coxhill. I didn't so I got what I paid for. A piece written and scored for five clarinets by Mattias was the only 'original' played and I enjoyed it as much as the old warhorses.One query; why did The Sage's much vaunted acoustics deaden the brass so much on 'Sing, Sing, Sing'? Still, it was an enjoyable evening although I won't be getting rid of my original recordings! This month's edition of 'Remember When' features an interview with former George Evans' singer Ivy Barnes on her days at Newcastle's Oxford Galleries. It features photos of the Evans Orchestra including a reunion one that has Zoe's dad Mike Gilby in the trumpet section. A good 50psworth. 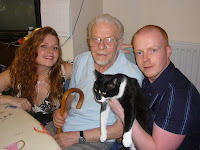 Photo below (not from magazine) supplied by Hilary Gilby shows Mike with Zoe, Scott and 'Figaro' Gilby. Tonight it rained so hard I almost stayed home but, being that time of the month; by which I mean the week when the Alan Glen Trio play the Chilli, I braved the elements and guess what? Alan Glen didn't! He'd damaged his wrist and had to cancel. Nevertheless, despite this setback an entertaining evening ensued with lots of bop opera performed. I should explain here that I'm using opera in its context as the plural of opus and not because we had the 'pleasure' of Dave scatting on an aria from 'Faust'. Mark Williams on guitar excelled, as did Daniel who sat in for a couple, whilst saxes John (not last week's John) and Darren also soloed well. In fact most of the guys blew good on most of the numbers. The big weakness here is inevitably the beginnings and the endings which lack the cohesiveness the solos in the sandwich deserve. Still, a minor point given the casual laid back atmosphere of the gig. "...and 'Mambo de la Pinta' which I wrote for guys in different jails I'd been in." - Art Pepper. Austrailia has never been noted for its jazzmen so it was purely out of curiosity that I turned up at the Crescent Club; a venue that looks onto Cullercoats' golden sands. Hardly Bondi Beach I know but nor are the Red Hot Rhythmakers the Basie Band. What they are, are, a very proficient and well rehearsed young band that does its thing - hot dance music of the 1920's and 1930's - very impressively. The soloists played well without straying from the idiom and the ensembles sounded amazingly authentic for players who looked to be mainly in their twenties. Sandra, one of three females in the band, played drums and sang in an engaging Hanshaw/Etting/Morgan manner that proved popular with the audience. All in all, a pleasant afternoon. Those intrepid Kings of Rhythm from Jesmond West failed to have their spirits dampened by the Wallsend weather which was wet. Despite the rain, poor acoustics and an audience that was slowly drowning in apathy, WJRK gave a workmanlike performance. Understandably, they concentrated on theoretical crowd-pleasers such as "Indiana" and "Doctor Jazz" rather than the less hackneyed and often more melodic numbers from their CDs. Mike Durham gave a solid lead and Brian Chester's trombone was as ribald as ever but Derek Fleck on clarinet seemed to be under-miked. This wasn't a problem for the rhythm section. Keith Stephens, banjo; Phil rutherford sousa; Mac Rae drums came across loud and clear. I look forward to hearing them again in more compatible surroundings. "My family wasn't musical. A couple of distant relatives on my father's side were musicians; nobody seemed to like them very much." Ruby Braff. I sensed tonight, in the Arms of Chillingham, was going to be different. Firstly Dave had had a haircut and trimmed his beard; an action which in itself was almost as revolutionary as pianist Barry playing bass guitar which he did very competently tonight. Secondly, that brilliant guitarist Mark Williams was once more on the stand and thirdly, I won the raffle; a CD of some moderate interest. The band sounded good and got even better as the night progressed and sitters-in, sat in. These included Nicola on baritone sax (lovely big fat sound), Daniel on guitar, the inevitable David Carnegie - on piano tonight - and a guy called John, didn't catch his surname, on tenor who blew up an absolute storm on Quincy's"Killer Joe". David C and Daniel also went slightly crazy on this number. Possibly the best session since I started dropping by. Our local library were holding a CD sale so, having a restless pound coin in my pocket, I bought a disc by the Michiko Ogawa Trio; "It's All About Love". I'd never heard of the lady but the tunes were good and there was the added bonus of having Harry Allen on tenor so I thought, in for a yenny in for a pound. As expected, Harry Allen blew some stomping tenor especially his extended solo on the opening track, "You". However, the surprise was Ms Ogawa who plays some belting two-handed piano varying from stride to swing and, as if that wasn't enough, throws in some delicate, almost wistful vocals. "This is all I Ask", written by Gordon Jenkins, is a particularly poignant reading. My pound couldn't have been better spent if I'd bought a lottery ticket and hit the jackpot. An exaggeration, I know, but only a slight one. If you don't believe me, check the disc out on Google. "Polka Dots and Moonbeams" is a fine song and Stacey Kent can be, on occasion, a fine singer however, a girl singing about seeing... 'Polka dots and moonbeams all around a pugnosed dream' doesn't sound quite right. I know one or two pugnosed guys but none of them prance around in polka dots and if I suggested that they did it would be my nose that became pugnified and I'd be seeing stars rather than moonbeams. When Ella sang "Have You Met Miss Jones?" she changed it to Have you Met Sir Jones?" and that didn't sound right either.